Bad news: if you haven't already purchased Chunk, Pip Squeak, Mr. Squiggles, Num Nums or Patches, then you're too late to get this year's hottest toy: an electronic hamster -- the Zhu Zhu artifical rodent. Good news: you won't be giving someone an artifical rodent for Christmas this year. It's OK, though. Research has shown that what people really want for Christmas is cookies. (Study done by Food Blogga et al, October 2009). And since there are hundreds of cookies to suit any taste, they make the ideal gift, even for those difficult people on your list. One of the hottest cookies this year is Bacon Chocolate Chip Cookies. If you haven't yet hopped on the bacon dessert bandwagon, then now is the time. The pairing of bacon with sweets sucah as chocolate, caramel, and maple syrup makes sense if you consider how much we love sweet and salty foods-- think kettle corn and chocolate covered pretzels. I have made these cookies with different ingredient pairings, and the maple smoked bacon and walnuts is my favorite. 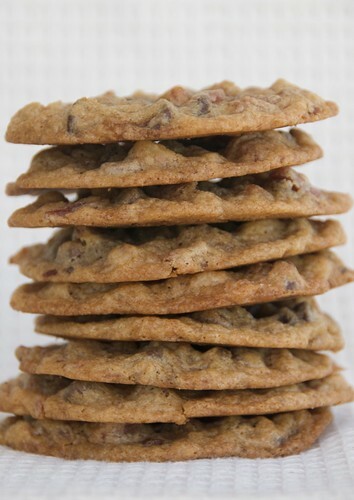 The salty, slightly smoky bacon intensifies the cookie's sweet, rich chocolate flavor, transforming an otherwise ordinary chocolate chip cookie into something extraordinary. So forget about the Zhu Zhu rodent, and give the gift of maple bacon chocolate chip cookies instead. Unlike this year's hottest toy, you won't have to worry about your supermarket running out of bacon. These Maple Bacon Chocolate Chip Cookies are my first entry for Eat Christmas Cookies, Season 3, the Zhu Zhu pet of Christmas Cookie Blog Events. Want to share yours? Find out how here. Today is also the first Eat Christmas Cookies Give-Away! From now through the December 20th, Santa and I will be giving away several sweet Christmas gifts to participants who submit cookies. For your chance to win Elinor Klivans's The Essential Chocolate Chip Cookbook, simply submit your Christmas cookie anytime between now and Saturday, November 28th. The Essential Chocolate Chip Cookbook contains 45 scrumptious chocolate chip-centric recipes ranging from comforting Chocolate Chip Gingerbread and Cinnamon and Chips Chiffon Cake to outrageously decadent Chocolate Chip Cookie Dough Cheesecake Bars and Hot Chocolate Chip Brownie Sundae Cakes. 1. In a large skillet over medium heat, add bacon. Cook, turning several times, until browned and cooked through, about 6-8 minutes. Transfer to a paper-towel lined plate to drain. Chop finely. 2. Preheat oven to 350 degrees F. Line two large baking sheets with parchment paper. 3. In a medium bowl, whisk flour, baking soda, and salt. 4. In a large bowl, using an electric hand mixer, cream the butter and sugars. Add egg and maple extract and beat until just blended. Add the dry ingredients; beat until just incorporated and the flour is dissolved. Stir in the chocolate chips, walnuts, and bacon. 5. Drop one large tablespoon of cookie dough 2-3 inches apart, as they will spread. (I put 6 cookies per sheet.) Bake for 10-12 minutes, or until firm and golden brown around the edges and still slightly soft in the center. Transfer to a rack and cool for 15 minutes. Follow the same instructions as above. Oh, and here's another great Christmas gift idea: An HP Touch Smart Computer! My friend Michelle of Scribbit asked me to help spread the word on her BIGGEST give-away ever! She is giving away an HP Touch Smart Computer! Visit Michelle for the details. But don't delay. The the give-away ends at 11:59 pm, Friday, November 27th. Good luck! One last thing! Stephanie of the wonderful Wasabimon! has posted an interview with me on her site as part of her series, Food Bloggers Spotlight. In the thick and chewy recipe you write 3/4 stick or 3/4 cup of butter. My butter sticks are 1/2 cup each. Is it really 3/4 CUPS (12Tbs) or 3/4 STICK (6 Tbs) of butter? Thanks for the cookie recipe. It sounds pretty incredible. Love your new picture too. It is cookie season, my favorite time of year:) Great creation! Bacon in a cookie? That would make my son-in-law's day! Wow - we just made bacon chocolate (with our own home cured bacon) the other week and it was awesome. This seems like the next logical step, right??? Oh, I have to try this! Leave it to you to be on top of the best cookie trends this season! Perfect! I recently saw maple bacon used in brownies - what a great combination! INCREDIBLE recipe - maybe too good to be true. (I did a double-take when I saw the title of this post.) Definitely going to make 2 batches of this. This is my recipe for really good Pumpkin Spice Bread. I'm sure these are pretty amazing!! I'm a big fan of the sweet/savory effect of adding bacon to desserts. Yumm! And I had NO idea about that hamster... Darn it, I missed my chance to purchase! I think you just answered my question of what was missing in my maple walnut biscotti that I just made the other day. They were good but I felt like something was missing. Of course, I was thinking more maple flavoring, but now that I read your recipe I know it was the BACON!! Great recipe. Happy Thanksgiving Susan! The sweet and salty factor strikes again. Last year it was caramel and salt for me..I may come over to the bacon camp. Oh my goodness! I simply must give this a try. I love bacon and if you think about it, pairing it with something sweet sounds really heavenly. Hi Susan... these look delicious! Oh wow, 3rd round of your contest this year, time flies! I stopped by today to wish you a Happy Thanksgiving! Uh, yeah, I'd rather have this cookie with 3 of my favorite flavors in it (no, I'm not talking about sugar, heh) than a toy rodent :) Awesome! lynn-How sweet that you think instantly of your son-in-law! mardi-Heck, yeah! Be sure to invite me over next time! karen-I have made brownies too. Trust me when I say they are INCREDIBLE! christmaself-Double takes are always welcome! Your recipe sounds wonderful! sues-Yeah, apparently artifical rodents are the toy of choice this year. annie-I'd like to try your biscotti with or without bacon. They sound fabulous! kate-I really hope you do! cris-That was awfully sweet of you. Thanks so much! mark-I'm with you, my friend! Bacon in cookies? That's new to me! Cookies make great presents. One year, I made several batches of at least 5 different kinds of cookies and gave them out to all of my friends. It was a fun and cheap present that they loved more than anything I could have bought them at a store! I love your photo!! Bacon and chocolate sounds like a good thing to me. i haven't yet jumped on the bacon dessert band wagon but chocolate chip bacon cookies might be my start! yum! I've already e-mailed my husband saying we have to make these to go in our cookie baskets this year! These cookies are a great idea. Thanks for the recipe! letmeeatcake-That's definitely a great jumping off point! mrsl-Yay! I'm so excited to hear that. Oooh, haven't seen many bacon-flavored sweets that tempt us, but this is the exception. Love that you included the 2 warring varieties -- thin vs. thick! Will try the thin recipe...yum! Holy cow, I think that may be the best cookie ever. I'm a sucker for anything that has bacon. Why shouldn't I put them in a cookie? Genius. definitely at least doubling it next time! Bacon chocolate chip cookies are certainly eye-catching & get a lot of media buzz, but for me, they didn't live up to the hype. I made them today, and although I love bacon & I love cookies, I don't love them together.